The premise of a serial killer who believes himself to be a modern day Duryodhana is engaging enough, but an interesting premise alone is rarely good enough for a reader to stick through a 300-page novel. So. does Arnab Ray pull it off? The antagonist fancies himself as Duryodhana’s reincarnation, and if you have read the Mahabharata you may have, at some point, wondered if Duryodhana deserved the treatment he received. Of course, he was greedy, vain, arrogant, and possibly, a megalomaniac – in other words, a true blue millennial. And what does Duryodhana’s reincarnation do in the 21st century? He seeks out those who wronged him in his previous birth of course. Rather, seeks out their respective reincarnations. The protagonist, Rukhsana Ahmed, a homicide detective in the Kolkata Police has to apprehend the killer before he can get to his final target. 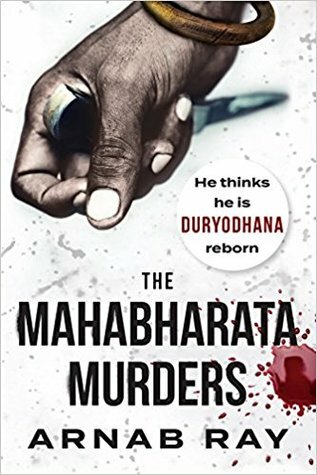 In Mahabharata Murders, Arnab Ray ticks all the right boxes, weaving a tale that is dark, sharp, and as cliched as it may sound - unputdownable. From the first page you are warped into the first of many crime scenes and as you begin to progress through the book you realise that this not quite the Kolkata of Bhodroloks. A lot of the characters are people we suspect may lurk in the fringes of society and you are more than glad to have been deprived of the pleasure of their company. But in the novel, they come alive with all of their menace and quirks, and appear believable, and dare I say it, occasionally likable. A protagonist that you end up rooting for, minor characters who leave a mark, and just the right amount of shock factor makes this book probably the best crime fiction I have read in years. And there's, of course, the dialoguebaazi. A cross between lines from Salim-Javed and Quentin Tarantino films, the dialogues and conversations are impactful, even when discussions revolve around mundane topics. Think the restaurant scene in Reservoir Dogs where the protagonists are discussing tipping, or analysing the meanings of songs. Strictly, these portions are not designed to move the plot ahead but it is difficult to imagine ‘Pulp Fiction’ without ‘Quarter Pounder with Cheese’. A grouch that I have with the book, however, is that it is not strictly a whodunit. But that’s more of a personal preference. The writing and the plot hold on to you and does not let go until you are done. Oh, and this is Arnab Ray’s finest work yet. Arnab Ray’s ‘The Mahabharata Murders’ is now available on Amazon and the Juggernaut App in India. Outside the subcontinent, it is available on Kindle.